Trimming for the textile industry, clothing and home decoration is applied ornamentation that raises the appearance of fabric and decorative touches to garments. Prior to the Industrial Revolution in the mid-19th Century, trim was made and sewn in by hand. Trimmed garments were considered a luxury because the hand-applied trims raised the value of the fabrics. Once trims were machine-woven and sewn by machine, trimmings fell within reach of even modest dressmakers and sewers. An abundance of trimming became the norm in mid-Victorian fashion, almost to celebrate the abundance. Although copious trim has gone in and out of fashion, it has always symbolized something luxurious, a notable added decoration that enhances the value of a garment. Decorative trim has gone well-beyond clothing decoration. The trimmings manufactured today are works of art in themselves. Embroidery consists of elaborate, tiny images of flowers and other beautiful objects rendered in cloth and thread. Modern embroidery manufacturing produces embroidery of stunning precision and beauty that can be sewn in or applied to any clothing, or even used in jewelry or personalized gifts. Lace also symbolizes the delicacy of nature in leafy or flowery silhouettes made out of thread. The way light passes through lace is one of the most celebrated properties of fabric. Lace is imagery and can add an air of delicacy and transparency to negligee, clothing, curtains, even the finish around wedding cakes. Passementerie are the tassels that finish chords and ropes, as well as formalized, stylized lacey trim made from cording and sometimes including beadwork. They are like a celebration that adds an air of gaity to any design, clothing or craft. Ribbon weaving has produced the extra shiny flare for hair dressing, hats or clothing since medieval times. Ribbon was a prize sought by travelling merchants. Ribbon has always been part of a prize or present that ties things in regal style. Trimcite is the home of trim creativity. 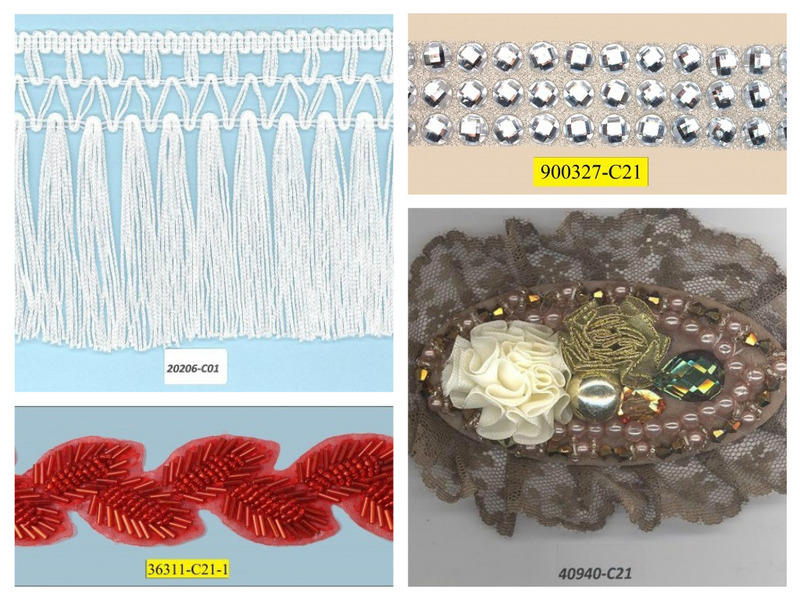 We have appliqués, beaded trims, laces, ribbons, and everything else in different sizes, colors and shapes which your creativity can apply. Please contact us to sample the potential.